Enter to Win $250 And FREE Dei Fratelli Products For A Year! You are here: Home / Great Deals / Enter to Win $250 And FREE Dei Fratelli Products For A Year! Dei Fratelli is having their Seventh Annual Ripened Recipe Contest to celebrate National Tomato Month. The contest begins October 1 and runs through November 15. Home chefs are encouraged to create an original recipe using at least one Dei Fratelli tomato product, including the Dei Fratelli TrulyTM Tomatoes that launched last year. The grand prize winner will receive a $250 VISA gift card, FREE Dei Fratelli products for a year, their recipe shared on the Dei Fratelli website, E-newsletter and social media pages, along with a YouTube video showcasing how to make the recipe for viewers. So, get creative and submit an original recipe using any Dei Fratelli products. Recipes using six ingredients or less and/or that can be prepared in under 45 minutes will receive a bonus from the judges as consumers are looking for simple and quick meals that are flavorful. Individuals may enter online at Facebook.com/DeiFratelli, at DeiFratelli.com, on Pinterest.com/DeiFratelli or via U.S. Mail. The top 10 recipes will be judged based on flavor, appeal and creativity. In addition to the grand prize winner, three runners up will be chosen to receive free Dei Fratelli product for a year and six honorable mention winners will be chosen to receive one month of free Dei Fratelli product and a Dei Fratelli home chef apron. All winners will be announced on December 15. New this year, a People’s Choice winner will be selected by the Dei Fratelli consumers in January. An additional six recipes will be posted on our website where consumers can vote for their favorite The People’s Choice winner will also receive a Dei Fratelli gift box of assorted tomato products. through January 18th with the winner being announced January 21st. I did throw together a quick meal for us using Dei Fratelli’s crushed tomatoes. I always consider a Crock Pot meal to be quick and easy because I can throw it all in and basically forget about it – which is exactly what I did. 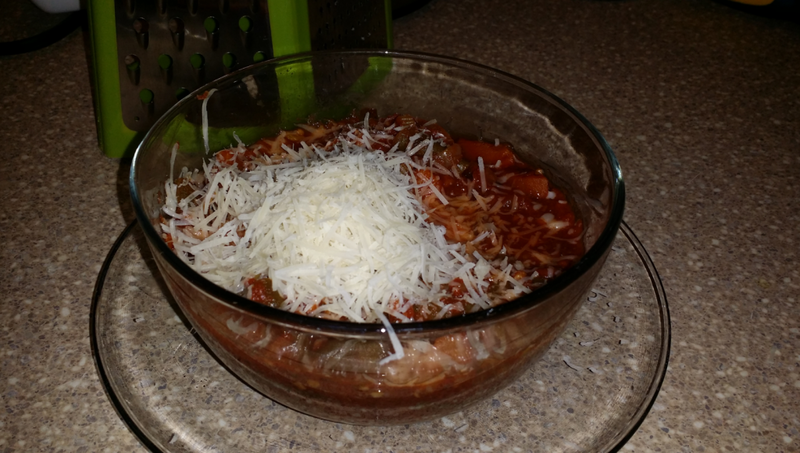 Add all ingredient to Crock Pot – except Parmesan, cook on high for 3 hours, or on low for 6 hours. Serve in bowls top with fresh grated Parmesan.